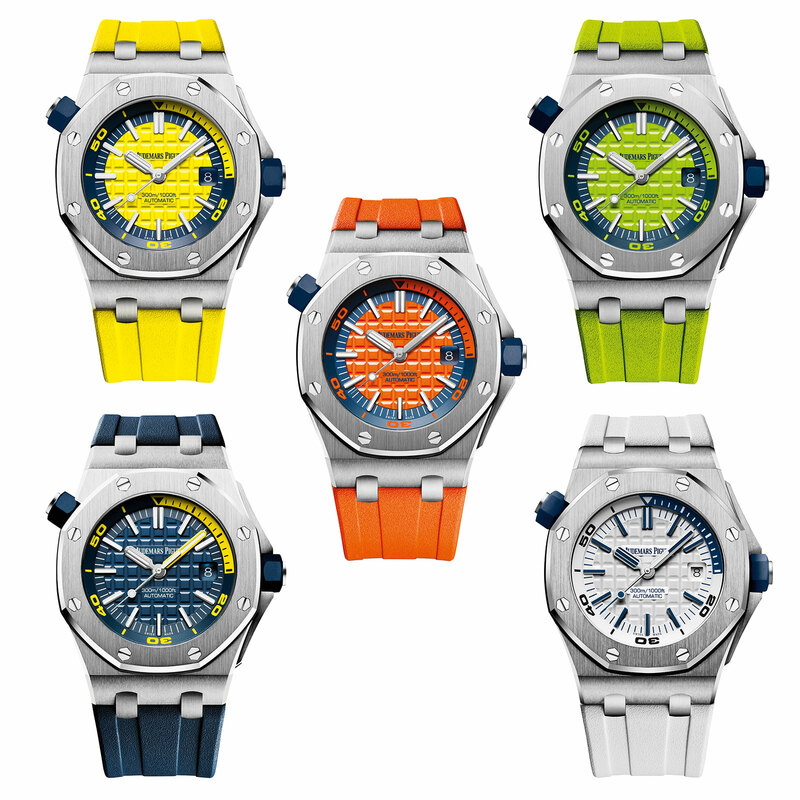 Five brightly coloured dials for the time-only Royal Oak Offshore Diver. 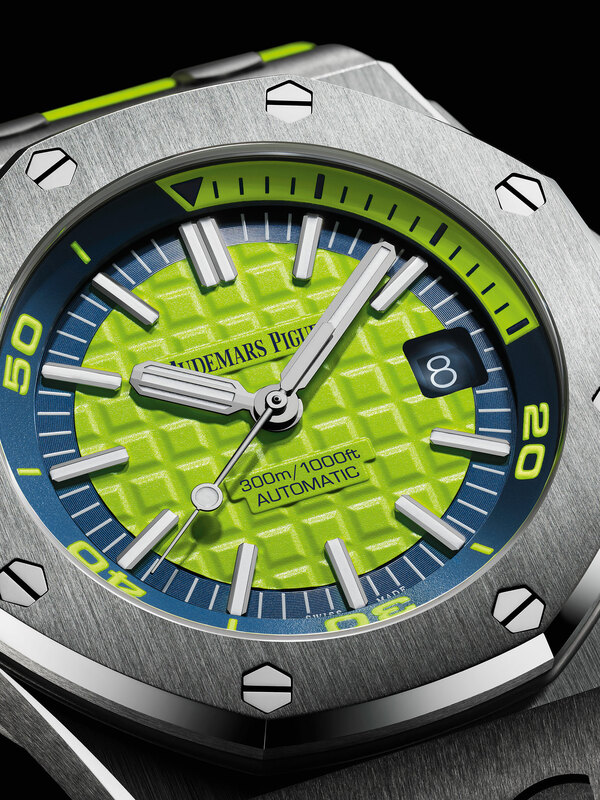 Last year Audemars Piguet introduced the Royal Oak Offshore Diver Chronograph in luminescent colours – that same colour palette has now been applied to the time-only Royal Oak Offshore Diver. 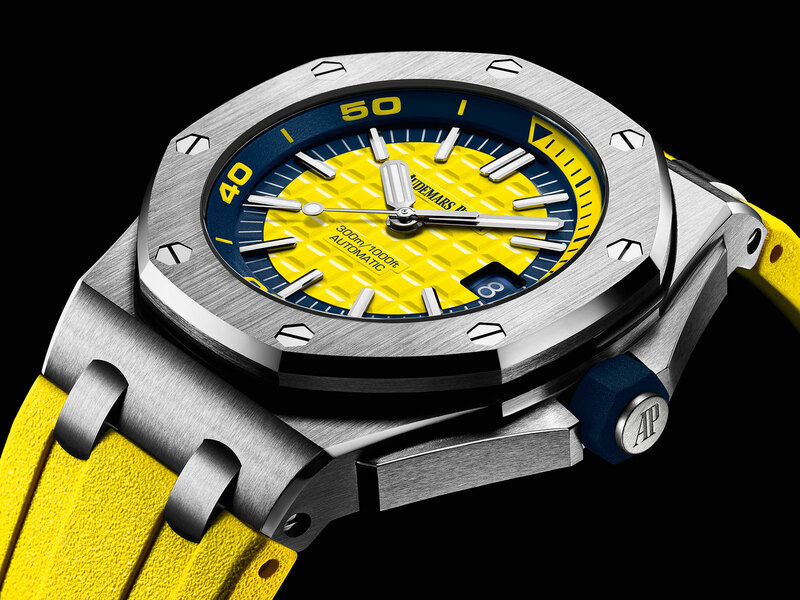 One of a dozen new Royal Oak models to be unveiled at SIHH 2017 tomorrow, the Royal Oak Offshore Diver “Funky Colour” is available in five different colours: white, blue, yellow, orange and green. Each dial colour has dark blue accents to match. 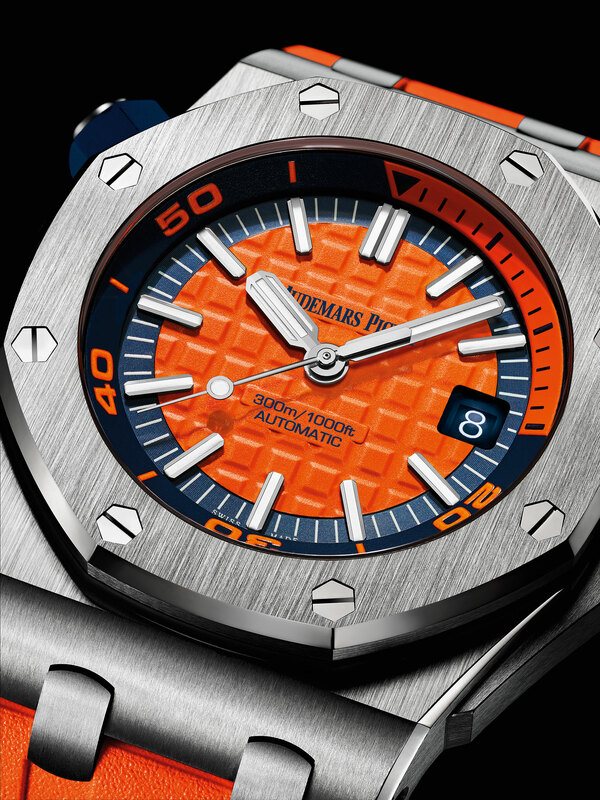 The dials are decorated with the chequerboard Méga Tapisserie guilloche that’s standard for the Royal Oak Offshore. 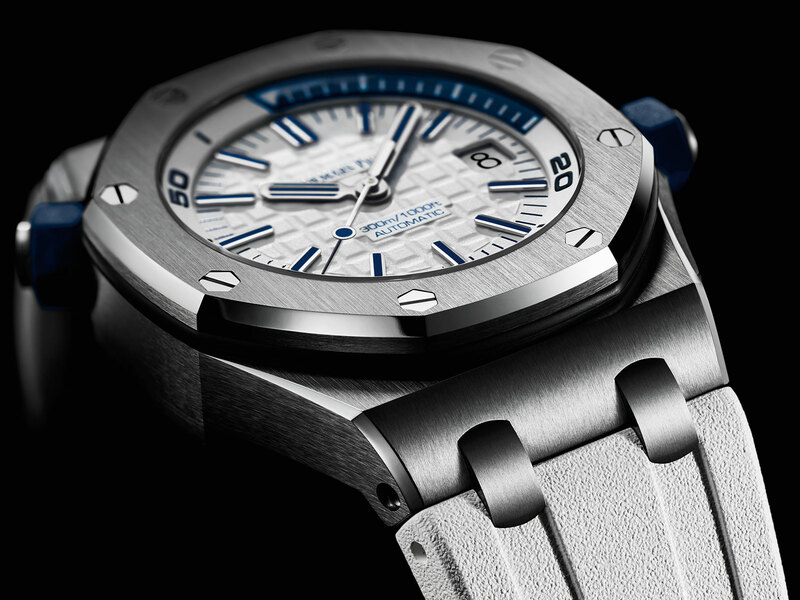 Colours aside the new Offshore Diver is identical to the previous models. The steel case is 42mm in diameter and rated to 300m, with the crown at 10 o’clock to rotate the inner elapsed time bezel around the dial. And it’s powered by the calibre 3120, AP’s in-house automatic movement. The Offshore Diver “Funky Colour” is delivered with two rubber straps, one to match the dial colour, and another in dark blue. 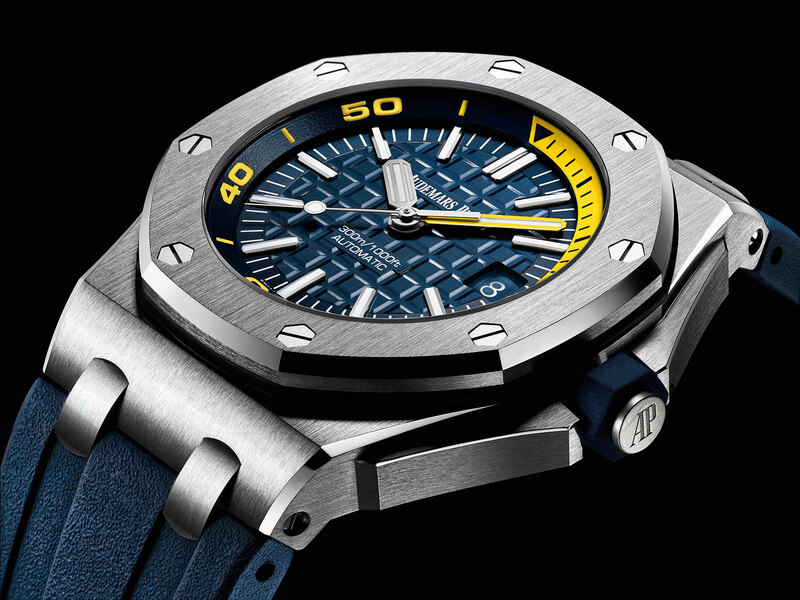 AP has yet to reveal pricing and availability, but with the earlier versions of the same retailing for US$19,000, expect this to be similarly priced. The octagonal perpetual calendar is now available entirely in hand-finished black ceramic.